And though these nobles of Israel gazed upon God, he did not destroy them. 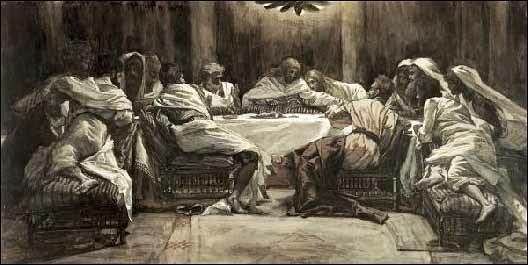 In fact, they ate a covenant meal, eating and drinking in his presence! Holy Eucharist is the act of giving thanks through the partaking of the Lord’s Supper: each believer commemorates the death of Christ by receiving the elements of bread and wine. At the table, the resurrected Christ meets the people of God as the heart of God makes known the love of God in bread and wine. Christ is present in the bread and wine of Holy Eucharist, he is present in the congregation, and he is present in the faith of each believer. This meal of the Lord renews within us the power of the Cross, the security of the new covenant, and love for Christ and one another. Through prayer; we are nourished by His presence. Through faith; we are strengthened by His grace. Through receiving; our intimate relationship with God is renewed. The Lord’s Supper is precious: an encounter with the living Christ. Grace is poured forth, faith renewed, spirit-encouraged, healing released, and hope restored at the table of the Lord. We eat and drink with the living resurrected Christ. Eating and drinking at the Lord’s Table is an experience of God’s work of salvation in Jesus Christ. It proclaims the Gospel through dramatization. It enacts the death and resurrection of Christ in such a way that the senses are engaged [as] the worshiper . . . sees, tastes, smells, and experiences the symbol of Christ’s death in the bread and wine. In this way, Christ is communicated to the whole person, bringing healing to body, soul, and spirit. Robert Webber, Worship Is a Verb: Celebrating God’s Mighty Deeds of Salvation (Peabody, MA: Hendrickson Publishing, 1992), 79. This entry was posted in Holy Eucharist, Robert E. Webber and tagged Lord's Supper, Robert E. Webber on May 31, 2011 by GlennDavis.